Once again, we return to Northumberland to step into a magical Christmas past and discover sounds, sights and mouth-watering tastes of traditional festivities from the 1820s to the 1940s. From the Beamish Bazaar to the Winter fun fair with a real ice-rink and sideshows, enjoy a warming hot chocolate while exploring the beautifully decorated homes and shops at this special time of the year at Beamish. We are even including a traditional 3 course Christmas lunch to complete our day. Monday  We depart Wiltshire and head north to our hotel in Tyne & Wear with time to settle in before tonights evening meal. Comfort stops on route. 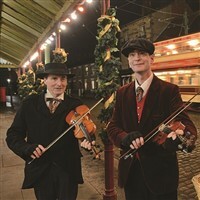 Tuesday  The highlight of this festive break as we visit Beamish The Living Museum of the North. Telling the story of life in North East England during the 1820s, 1900s and 1940s, see how families lived in the years leading up to the First and Second World Wars. Discover how life was on the Home Front, ride the tram and the railway and visit authentic shops, a colliery, a church, school house and many more fascinating buildings to nostalgically take you back to life in the previous century. We will also enjoy a full festive 3 course lunch in a private room overlooking the award-winning town. After your delicious lunch, enjoy tea or coffee before continuing to explore this living museum for the rest of the afternoon before returning to our coach and back to our hotel for dinner. Wednesday  Today we visit Durham with its beautiful cathedral on the River Wear. With plenty of free time to explore this historical city, the choice is yours. Later this afternoon we will visit The National Railway Museum at Shildon before returning to our hotel with time to relax before tonights evening meal. Thursday  Time to leave Northumberland and head south to Wiltshire where our taxis will be waiting to return you safely home after a nostalgic festive break.